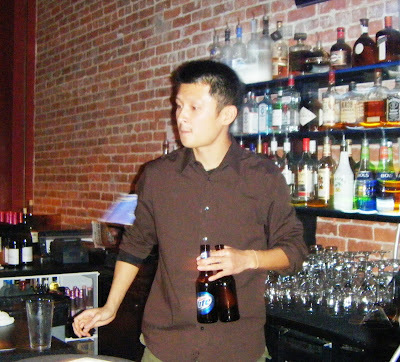 If Rob looks familiar, it’s probably because you’ve been drinking downtown at Red Fin in the Hotel Max, where he worked before opening Shiku (Korean for “family”). Here they’re selling deep-fried sushi rolls stuffed with cream cheese (among others), and their lengthy izakaya menu (“Japanese tapas,” explained my waiter) offers specialties like slow-braised kakuni pork ($8), seared peppered Wagyu beef with wasabi cream ($11) and some of the best tempura I’ve ever eaten ($7). 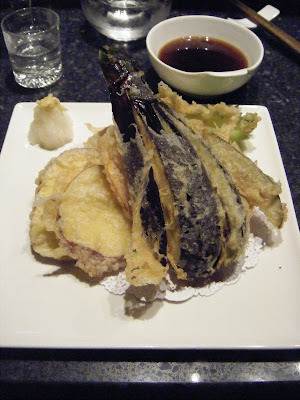 I went nuts over the light tempura-batter, but what really got me was the organic vegetables that made the dish special: Asian eggplant, Japanese sweet potato, lacy lotus root and delicate shiso leaf. Johnny made me a little plate of sashimi to start, followed by a pair of fresh uni nigiri whose roe was a deep gold and fresh from Santa Barbara. 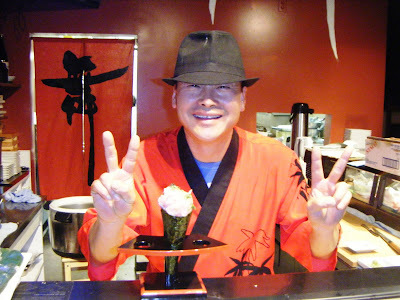 But the hit of the evening was definitely negitoro — the fatty tuna handroll he’s serving me in the photo above. “Real wasabi,” he said when he handed it over. Much appreciated, John-boy. And yes, I knocked back some sake and immediately felt lots mo’ betta. Johnny and I chatted about Korean restaurants. He’s a big fan of Ka Won , in Lynnwood, spends a lot of time hanging at Pal-Do World and is looking forward to the new H Mart — a huge Korean supermarket — set to open in Lynnwood this week. So we were kindred spirits for sure. Which explains why he shared his dinner with me, insisting I have just a few more slices of his private stash of soondae — the blood sausage stuffed with cellophane noodles imported from L.A. Delicious! Anyway, Shiku is a sweet little spot. That guy Rob’s a nice kid, the atmosphere’s got it going on and I’d be back just to shoot the breeze with Uncle Johnny who — fear not — is far more likely to ply you with a “Bruce Lee Roll” than a slice of blood sausage.